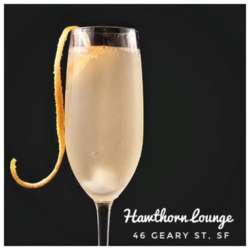 Join Alexandra, Conyee, and I for an evening of connecting with expats and locals in the San Francisco community at one of the BEST San Francisco hotspots, Hawthorn, a retro-chic cocktail lounge featuring delectable craft cocktails, great music, and 2 different dance floors. InterNations has exclusive access until 9PM (21:00), and attendees are invited to stay after the IN event to partake in Hawthorn's after-party featuring music and dancing, starting at 21:30. (InterNations members arriving after 21:00 will be subject to Hawthorn's line and cover charge). So, don't miss this opportunity to meet friends and mingle with other expats and global minds from all over the world! Please don’t forget to RSVP for this event! (This helps the venue plan staffing for our event as well as helps the Ambassador team with logistics). As always, Alexandra and I look forward to seeing you on Saturday, 2 March!